Heat coals or gas grill for direct heat. Thread chicken, potatoes and celery alternately on each of eight 8- to 10-inch metal skewers, leaving 1/4-inch space between each piece. Mix oil and pepper sauce; brush over chicken and vegetables. Sprinkle with pepper blend and seasoned salt. 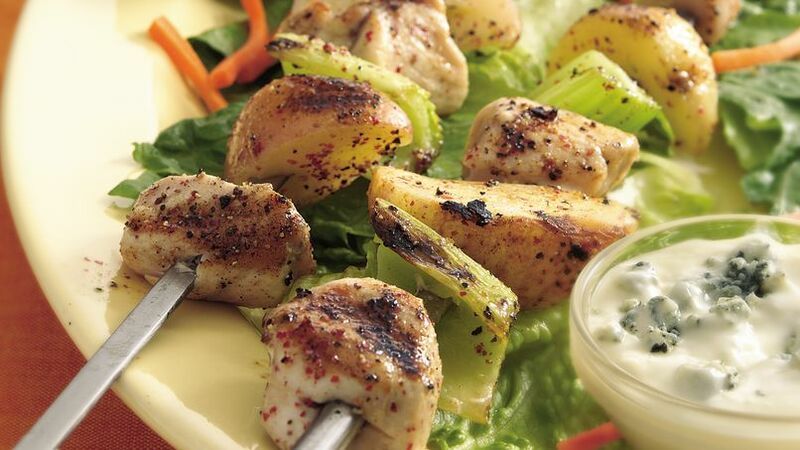 Cover and grill kabobs 4 to 6 inches from medium heat 15 to 20 minutes, turning occasionally, until chicken is no longer pink in center and potatoes are tender. Arrange romaine and carrot on 4 individual serving plates. Top each with 2 kabobs. Serve with dressing. If you don't have the refrigerated potatoes, use fresh new red potatoes. Because the refrigerated potatoes are partially cooked, you'll need to slightly cook the fresh ones. Place 2 cups of new potato wedges in a glass casserole. Cover and microwave on High for 3 to 5 minutes, stirring once, until slightly cooked. This is a super one-dish entrée salad, so all you need to add is warm garlic bread. Wrap it in foil, then heat it on the grill for 5 to 10 minutes. This recipe is based on the popular Buffalo Chicken Wings appetizer that originated at the Anchor Bar in Buffalo, New York.